Enchanting Plus is a mod which allows the player to have full control over the enchantments on their items at the cost of significantly more EXP. Once you have the mod and it's dependencies installed, you will be able to use the Advanced Enchanting Table. This table can be crafted in a crafting table, or you can craft the table upgrade item to convert an existing table in the world into the advanced table. Once you have the new advanced enchanting table, you can right click the table to access it. In the advanced table menu, there is an item slot near the top for putting in the item you want to enchant. When an item is in this slot, the center area will fill up with a list of all the valid enchantments that you can modify. If there are more than four possible enchantments you can use the bar on the side to scroll through them. Sliding the bar to the right will increase the level of the enchantment, and sliding it to the left will decrease it. If an enchantment is listed with a green background it means you can modify that enchantment. If the background is red it means that enchantment is not available. Enchantments normally become unavailable when another enchantment that they are not compatible with has been selected. For example, Silk Touch is not compatible with Fortune, so you can not try to put both on the same tool. As you modify the enchantments, the enchanting cost will change. This mod uses EXP points for cost rather than levels. The amount of EXP points the player has, and the cost are both shown in the top left info box. This info box will also show other bits of information such as tips about the mod. 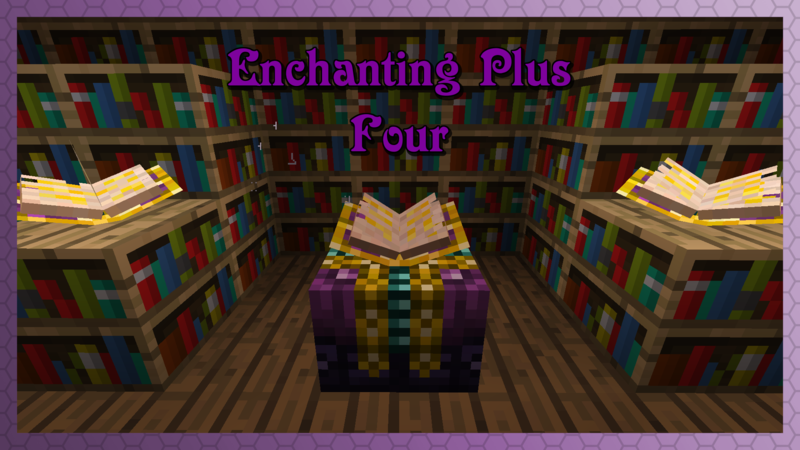 Once you are ready to enchant your item, and you have enough EXP points, clicking on the enchanted book button will enchant your item. Some enchantments in the game are given the special classification of curses or treasures. These enchantments are not available to the player under normal circumstances and special conditions must be met in order for them to be available. Curses such as the curse of binding can only be applied near midnight, on a night with a full moon. The player has a four real life minutes to work with curses, two minutes before and after in-game midnight. You can check if it is midnight by looking in the sky for the moon. If it is directly above the player it is likely midnight. Full moons happen once every 7 days in Minecraft. You can verify the conditions are right by standing close enough to the table for the book to open. If several candles of purple smoke appear around the table then all the conditions have been met. Treasures are not currently available through the advanced table. I am planning to make them available, however I don't know a good way of adding this feature. This mod provides a bunch of configuration options which allow you to do things like change how much EXP certain enchantments cost, and also blacklist certain enchantments or items from being allowed in the advanced table. I am planning to add more configuration options in the future. If you would like to see a specific option, please create a new issue on the GitHub page requesting the feature. This mod fully supports all enchantments that have been added to the game, including enchantments added by other mods. If an enchantment from another mod is not working as intended, it should be reported as an issue. This mod has special support for CraftTweaker. You can use ZenScript to apply configuration changes to the mod. mods.eplus.Eplus.blacklistItem(IItemStack item); Can be used to blacklist an item. mods.eplus.Eplus.blacklistEnchantment(IEnchantment enchantment); can be used to blacklist an enchantment. This mod has special support for Just Enough Items. If you look at the uses for any of the items/blocks added by this mod, there will be an info tab which gives a summary of what it does. I love your mod, it's perfect! One suggestion for Treasure enchantments, I think for now until you find a better way, why not let Treasure enchantments like Mending be available on Full moons? I found the solution to this issue! And click on " GUI Scale "
Choose Large instead of Auto, mine was on auto and it screwed up the tooltip. a mobs that are attracted to enchanted items - more enchantments stronger or more mobs etc. this add some risk of onehit sword etc. some items that you need to add enchants - few blaze powders for fire aspect etc. In it's current iteration I think this mod is actually under powered when compared to vanilla. Vanilla enchanting costs 1-3 levels of experience, while this mod can easily cost ~30 for a basic enchantment. The vanilla enchantment table also gives you some information about what you're getting and can be combined with books to get exactly what you're looking for. The main advantages of this mod are that it makes the enchanting system more accessible. i like enchanitng from quark with a "minigame" you still see what youre adding but its "random"
Enchantment plus is pretty op because if you can get tons of xp fast by building a mod farm or in my opinion the better: farm pigmen in nether with XP boost 3 enchantment from Endercore mod, then you can just make the most powerful items in a few clicks :P and you dont even need bookshelves anymore because they only give a xp reduction now. Farming pigmen in nether with xp boost 3 which gives 120% more xp I got to level 50-60 in like 10 minutes with no effort att all. But still I really like it alot better than vanilla, in vanilla it was too random and if you didnt get the enchantment you wanted then you had to enchant one item to refresh the list and even when I farmed zombiepigmen in nether which gained me xp very quickly especially with xp boost 3 enchantment from Endercore mod, it was still so frustrating. I wasted tons of swords and armors and had to go back to mine more iron and diamond lol. A config to get rid of the "Treasures" list would be great. So it seems that daylight is not a factor in the new treasure enchantments, it lets me apply mending whenever it's night or in a thick box of obsidian with no light coming in. Also it would be cool if we could use lapis blocks for the floor as well since we don't have a lapis sink with this mod added. It would be nice if he added a lapiz lazuli requirement for enchanting with the advanced enchantment table like with the default one! Can I use the mod in a public modpack? Hey where can i find the config for the mod? "treasure enchantments require a floor of precious material, and daylight"
What does that mean? Precious material? Blocks that are "precious", like iron/gold/diamond blocks. Anything that can be used in a beacon. Was disenchanting removed in the 1.12.2 version? Disenchanting was not removed, you just don't get EXP for it now. It was removed because too many mods do weird things with their enchantments allowing for negative disenchanting costs and infinite EXP. If it wasn't removed, then there's a pretty big bug happening, because 90% of the time or close to it (enough that when it does work it looks like that's the bug) when either I or the YouTuber I mentioned tries try to disenchant anything, it doesn't work. Not just 'doesn't give any XP', but 'the slider doesn't move unless it's an enchantment we were putting on ourselves right at that moment but decided against'. As for the why, yeah, that makes sense. Still a bit annoying though (like other than curse enchants, what's the point of disenchanting if you don't get anything for it? ), but I get your rationale. Could you make it a config option at least, maybe?